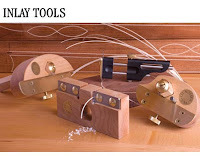 Lie Nielsen now carries tools to create string inlay* (pictured at right) based on Steve Latta's innovative designs. 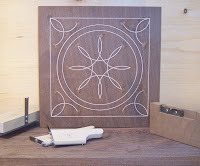 I took Steve's inlay class a year ago at Olde Mill Cabinet Shoppe, where we made simpler versions of the tools (pictured below). The radius cutter pivots on a point while little teeth plow a groove for the inlay. You can see a close-up of the teeth configuration on the L-N website. In Steve's class, we also made a tool that plows a straight line and a thicknessing gauge that ensures the veneer strips are consistent in width. 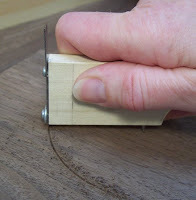 To use the gauge, you pull the veneer stri p through a kerf in a block of wood. One side of the kerf is wood. The other side has a little scraper attached to it. L-N also offers a dvd featuring Steve Latta creating the line and berry technique. I have not seen this video, but I can vouch for Steve's excellent teaching skills. 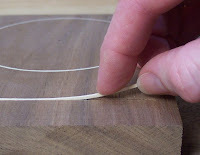 It's easier than you might think to add decorative string inlay to your projects. *I do not sell for Lie-Nielsen (or Steve Latta), nor have I used their inlay tools, so I cannot comment on their performance.